omid (mashhad, Iran) on 26 January 2012 in People & Portrait and Portfolio. That is quite a good dump of snow. He seems to have the right shoes. Nice shot, glad to see that someone has a real winter this year. I always find myself forced to use the road too. A beautiful street shot ! Love images from the snow . . the real thing is not so welcome, though ! Nice image with the snow falling down! Nice street scene, I like the walker here. I thought there was no snow on you, do not flock here seen it rain and rain. Nice with all that snow! Where is it? Cool street scéne and You have this nicely photographed. a very nice "wintery" image - don't tell me that's in mashhad, though !!! Wonderful image with the snow falling down Omid! Very nice composition, love this shot, bravo. A great capture of the snow here. The snow on the car gives a good sense of how much snow came down. / Or then put spiked shoes:). I like the very visible snow flakes on the black suit and the red which catches the eye! Beautiful winter scene ! @franz: Not, Imagine you have been wrong. Iran is a vast country that in different parts of it at a time, There are all kinds of weather ! Areas of very warm, Until very cold and mountainous areas. Beautiful street scene! The snow on the trees is lovely. We have not gotten any snow. 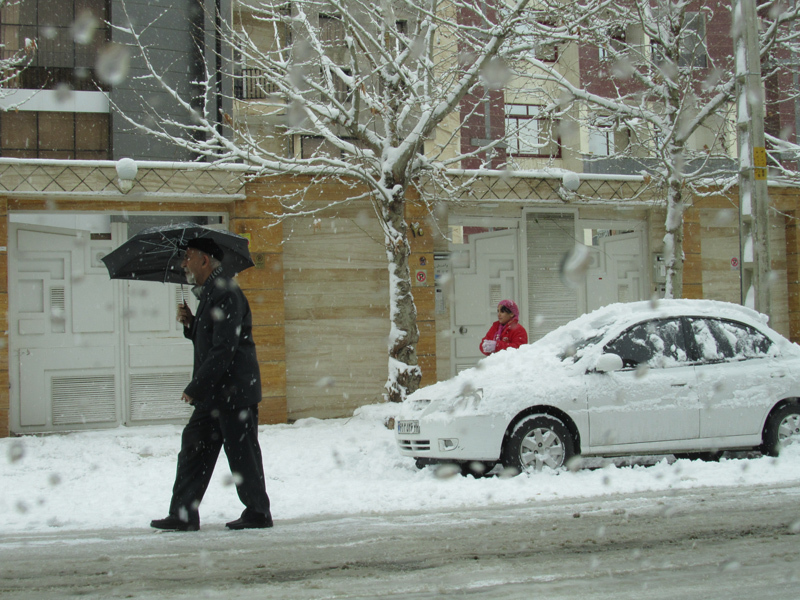 Lovely winter scene, love how the elderly man is walking in the street, well seen! Nice picture of winter discomfort. Good composition. Nicely done. That's right but atmosphere is wondrful. bonita composicion en esta captura!! Nice to see you have snow there (I'm not sure if you are happy...)!